Jolene is the newest Physical Therapist to join B2N. She is thrilled to be able to bring her expertise to create a holistic, patient centered pelvic health program in St. Petersburg. Jolene moved to St. Pete in the summer of 2017, and has traveled the world with her family and husband (an active duty Marine). Several injuries during early years as a gymnast and equestrian, followed by having two children, led Jolene on her professional mission to become an expert in spine and pelvic health. 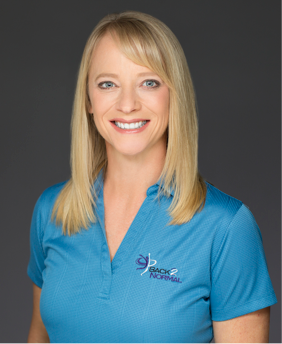 She has extensive training in manual therapy, and is a Board Certified Clinical Specialist in Women’s Health Physical Therapy and completed her doctorate in physical therapy in 2018. 18 years of practice has enabled Jolene to create and implement several pelvic rehab programs for pregnant women, post-natal pelvic issues, prostate cancer programs (pre and post operative treatments), pelvic and abdominal surgical care, male pelvic pain (among active duty Marines and Sailors), complex orthopedic pain management, and maintenance programs for athletes of all ages and abilities. Jolene values grassroots education, and has worked with the Section on Women’s Health to write, edit and distribute resources for continence, prolapse care, postpartum healing and safe exercise programs. She has presented at the national Combined Sections Meeting for the American Physical Therapy Association on Male Pelvic Pain. Jolene works within the community to promote pelvic health among personal trainers, yoga instructors, medical providers and other therapists, on early and effective treatments for spine and pelvic dysfunctions. Jolene spends her free time outside running, working out with friends or kids (obstacle courses are a big hit), or enjoying life on the water in our beautiful community. Jolene looks forward to partnering with you on your investment in your health and body.